The framing crew is putting the finishing touches on the roof today–fascia and barge rafters! They may not finish until tomorrow, but it doesn’t matter too much. We don’t have the roof sheathing material on-site, so we couldn’t get started on that even if they *did* finish today. The GC should have at least the initial material (CCX plywood for the eaves) by tomorrow afternoon, so perhaps we’ll get started then. God, I’m looking forward to having a roof again! Having the sun beating directly onto the ceiling makes the house unbearably hot. I should have realized that was going to be a problem, but it completely blind-sided me. Fortunately the weather has been pretty mild the last few days–highs have been in the low- to mid-80’s. Phew! 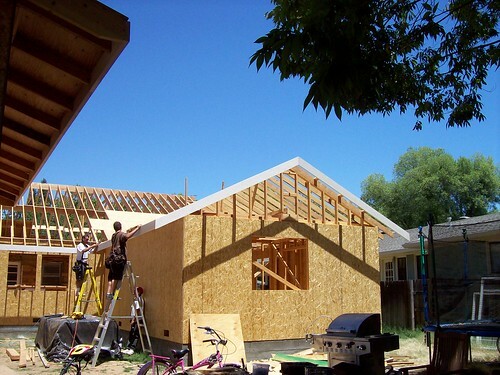 This entry was posted in Our home remodeling project, Uncategorized and tagged framing, roof. Bookmark the permalink.